QNAP Systems, Inc. partnered with Vinpower Digital, a leading supplier in Optical Disc hardware and media solutions, to integrate Vinpowerâ€™s industrial-grade blu-ray optical disc drive for the TVS-882BR Blu-ray NAS series, allowing users to write NAS-based content directly onto CD, DVD, or Blu-ray optical discs as an additional back-up solution. The TVS-882BR series provides an excellent solution for storing large amount of digital contents and allows for easy sharing through a network. However, itâ€™s always recommended to follow a â€œ3-2-1â€ rule when storing digital content. The â€œ3-2-1â€ rule represents having at least three copies of your data, of which two should be stored on two different media and one backup copy should be kept offsite. This rule is specifically designated for protecting against natural disasters that could potentially destroy all property and data stored in an affected region. That is why QNAP had the foresight to also include a Blu-ray writer drive onto theTVS-882BR Blu-ray NAS series. 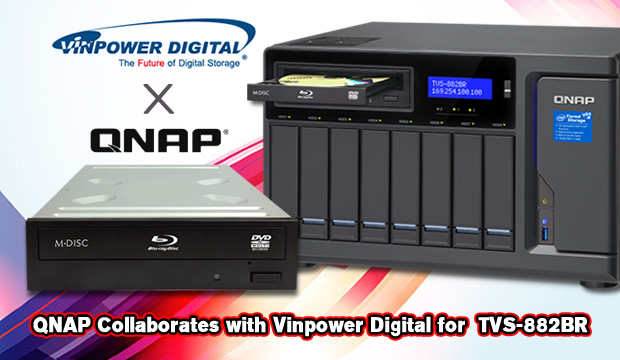 By integrating Vinpowerâ€™s industrial-grade Blu-ray writer drive, QNAP TVS-882BR series allows users to create a backup copy onto virtually all formats of optical discs, such as CD, DVD, and Blu-ray discs (including the 100GB+ BDXL media) that can be safely stored offsite. Optical discs are made from plastic with an archival grade hard coating, ensuring the backup data will not degrade or be susceptible to the elements, thus providing a longer archival offering.â€œQNAP is excited to work with Vinpower Digital in integrating the industrial-grade Blu-ray writer drive,â€ said Dan Lin, Product Manager of QNAP. â€œVinpower has been a leading innovator in the field of optical disc hardware for over 20 years and has been integral in working with QNAP to add optical disc burning capabilities that meet QNAPâ€™s high standards for reliability and longevity,â€ Lin added. For more details about Vinpowerâ€™s full product line, please visit www.vinpowerdigital.com or speak with a Vinpower representative near you. 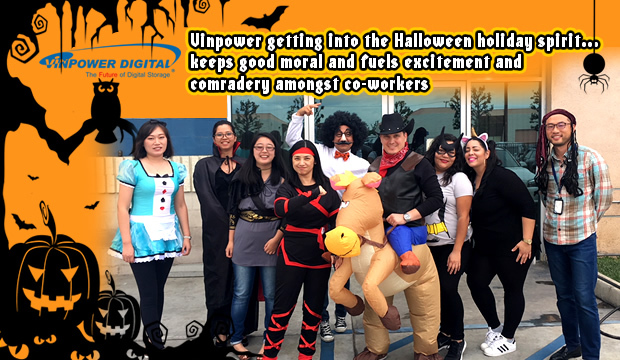 Letting loose on holidays and special occasions allows Vinpower to better focus on our core product lines and deliver the best quality and reliability for all of our Optical Disc, Flash, and HDD/SSD duplicators, media, and accessories. So if youâ€™re in the market for digital duplication media or hardware, Vinpower is your friendly and down to earth partner that can assist you with all your needs. For more details about any of Vinpower Digital’s range of hardware, software, and media offerings, visit our website, www.vinpowerdigital.com, or speak with an authorized Vinpower representative near you.